The Planted Trees: Scripture Sunday: Where's Your Focus? Tonight with my kids at church we studied Genesis 12 and some things jumped out at me that I wanted to share. This chapter is where we are introduced to Abram, aka Abraham, in scripture. Later in the New Testament he will be heralded as a man of faith numerous times, but here we see him just beginning his walk with God. And it's not a great start. In verses 1-9, God calls Abram to leave Haran where Abram, Sarai, and Lot had been living with Terah, Abram's father. God gives Abram four promises: 1) I will make you a great nation, 2) I will bless you and make your name great, 3) I will bless those who bless you and curse those you curse you, and 4) In you all the families of the earth shall be blessed. So Abram leaves Haran to follow God into an unknown land, taking Sarai (his wife) and Lot (his nephew) with him. When Abram arrives in Canaan, God appears to him and promises Abram that this land will be given to his descendents. Abram builds an altar to God and settles east of Bethel. Things are going well for Abram at this point. God has fulfilled his promise to bring Abram to a new country, so now Abram just has to wait for God to fulfill his other promises. But life doesn't work that way! In verse 10, a famine comes over the land of Canaan and Abram and Sarai head to Egypt just like some of their descendents will do as well (Jacob, Joseph, Jesus). But that's where the problems begin. There are three things that Abram does because he begins to focus on himself. 1. Abram leaves. In Genesis 12:10 it says, "Now there was a famine in the land. So Abram went down to Egypt to sojourn there, for the famine was severe in the land." There is one thing missing from this verse, "And God told Abram to go..." God had promised to bless Abram, but a famine comes and Abram gets worried. He decides to take matters into his own hands. Maybe he heard that there was food in Egypt. He makes plans to go there for a little while until the famine in Canaan ends. But God didn't tell him to go; God had given him Canaan not Egypt. Abram chooses to leave the Promised Land because he has focused on himself. 2. Abram lies. Once Abram leaves the Promised Land, he continues his sinful path. 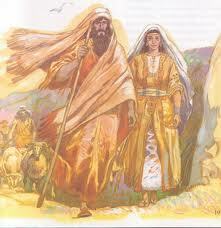 He advises his wife, Sarai, in verses 11-13 to lie about being his wife. She is very beautiful, and Abram is worried that he might be killed because someone might want her for their own. Technically, it isn't a lie (she is his half-sister), but it is an omission of truth about their relationship. God had promised Abram that he would not let any harm come to him (bless those who bless; curse those who curse), but Abram again feels the need to solve his own problems. Abram lies because he is focused on himself. 3. Abram looks the other way. Sure enough, Sarai comes to the attention of the Pharaoh in Egypt and is taken into his house. Now she is not in Pharaoh's home to decorate or cook some Canaan cuisine, she is being brought into his home to become either a concubine or a wife. And Abram lets this happen. Not only does he let it happen, but Pharaoh sends gifts to Abram (v. 15-16). A purchase of Sarai, if you will. And still Abram does nothing to rescue his wife. He chooses his life and his property over his responsibility as a husband because he is focused on himself. God intervenes, rescues Sarai from Pharaoh's home, and Pharaoh kicks Abram and Sarai out of Egypt (12:17-20). But who knows what would have happened if God hadn't helped Abram out of the mess he'd gotten into because he looked to himself for solutions. Abram goes on to become an example to all believers of having astounding faith in God, but he shows his humanity, his fraility, and his rebelliousness in this instance. And he teaches us a lesson about what happens when we stop focusing on God and His promises to us and start focusing on ourselves and what we want or think is best. When we step out on our own, it will never turn out well. And that's a promise you can take to the bank. Excellent thoughts! So often we come up with our own "bright ideas" and create a mess. Good thoughts! Thanks for sharing! This portion of Scripture always makes me feel better-if Abraham is in the faith hall of fame, perhaps I will get a nod. ;) I always need to remember that God has things under control! I learn more and pick up more Bible lessons when I am teaching our Children's Bible Hour group on Sunday night. When I taught this to them, the lack of Abraham's faith really jumped out at me. As we finished our lessons on Abraham, the kids could really see how God remained faithful and eventually Abraham's faith had grown enough that he was willing to offer Isaac. Abraham is truly an amazing study!